Will the Canon Pixma MP370 printer accept XL cartridges? We only sell one size of cartridges for the Canon Pixma MP370 printer so it's not possible to use XL cartridges in this machine with a higher yield than the ones advertised as far as we're aware. Please contact Canon directly if you need to confirm whether or not any high capacity ink cartridges are available for this model. It's a waste of money buying the Pixma-370 original cartridge or MP370 compatible ink on the high-street when it's easy to save money ordering online with Cartridge Save. Order Pixma MP370 ink cartridges from us because everything is guaranteed by a no quibble money back guarantee. Remember that each and every order has free delivery, typically arriving with you the very next day! The Canon Pixma MP370 is an efficient digital photo centre, producing professional-grade images. This digital photo printer supports direct printing from memory cards and compatible cameras, while offering fast copy and scanning features. Fast connectivity and data transfer via high-speed USB saves time and ensures high-quality prints and scans. The Canon Pixma MP370 offers maximum resolutions of up to 4800x1200 dpi. However, this unit does not provide fax options and running costs are quite high. The Canon Pixma MP370 is a fitting choice for those who want a uniquely designed and stylish photo printing unit. The Pixma MP370 printer has a z-shaped configuration, with the flatbed unit sitting right on top, along with the control panel and small LCD display. This model features a digital copier and scanner, which can scan directly to various memory devices. For PC-free printing the Canon Pixma MP-370 offers a lot of connectivity options, including PictBridge support and memory card slots. High-speed USB comes as a standard interface. 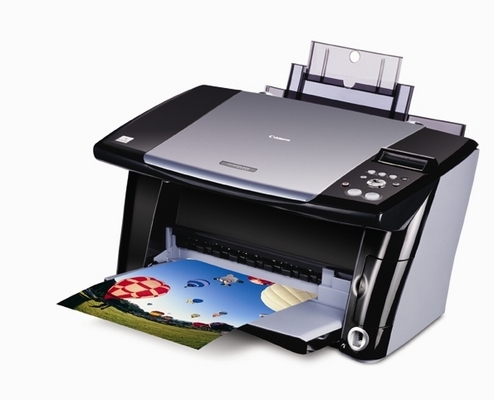 Superior copy and scan quality and stunning photo prints are guaranteed with the Canon Pixma MP370 inkjet printer. The MP370 can produce 18 pages per minute for monochrome outputs and up to 12 pages per minute for colour prints. Standard photo sizes can be produced, and a photo index can be printed for every photo set. Versatile compatibility means that the Canon MP370 can be used with almost any Windows and Mac computers. The Canon Pixma MP370 photo printer is a good choice for users looking for an efficient photo centre. However, the Pixma MP370 colour printer lacks complete MFP features like fax, duplex and ADF functions, and is quite expensive to maintain.